Relax! 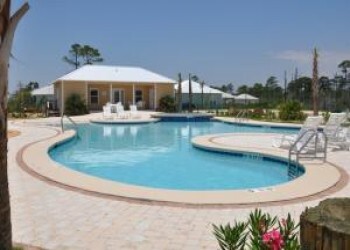 Rookery III is located on the Fort Morgan peninsula in Gulf Shores, Alabama. This unique community of charming stand alone cottages is within walking distance of the beach and adjacent to the Bon Secour National Wildlife Refuge. The new Gulf Shores Marina at Fort Morgan is a short drive on down the peninsula. It has boat slips for daily lease, charter fishing, dolphin/sightseeing cruises, a store for supplies/souvenirs and Tacky Jacks 2 restaurant. Also on the peninsula are golf courses, boat launch facilities and ferry boat rides to Dauphin Island. Gulf Shores is a vacationer's paradise with amusement parks, waterpark, miniature golf, snorkeling/diving, Tanger Outlet stores, shopping, beauty spas and great restaurants. This brand new cottage is the perfect place to stay. It's beautifully decorated island style with an open floor plan, HDTVs, stainless steel appliances in a fully furnished kitchen (laundry closet in kitchen) and an enclosed porch for relaxing. Three bedrooms (1 King, 2 Queen) and a queen sleeper sofa accomodate 6-8 people. Rookery III features 2 large pools. One pool (located just steps from this cottage) has a children's pool also. Come on down and enjoy Alabama's Gulf Coast. You will love Rookery III cottages!